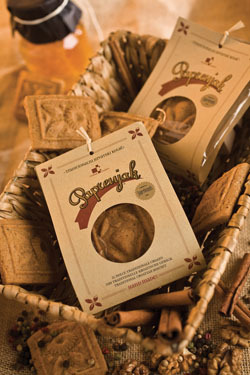 Our most representative product that presents Paprenjak — Traditional croatian biscuit. It carries the Story about Paprenjak. Originally made for the guests of Croatia Airlines, but now also available at lower altitudes, as a single-packed Paprenjak biscuit! Tin box containing 250g of Paprenjak. 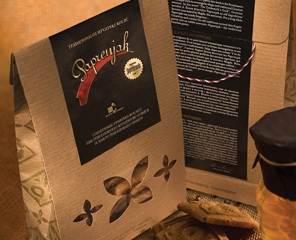 Luxurious package presenting Paprenjak as the traditional Croatian biscuit, carrying the story about Paprenjak. 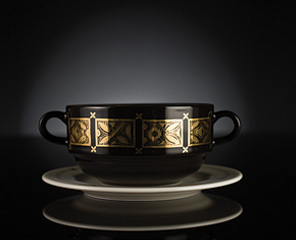 A set containing a bowl and a plate adorned with the traditional motives of Paprenjak. 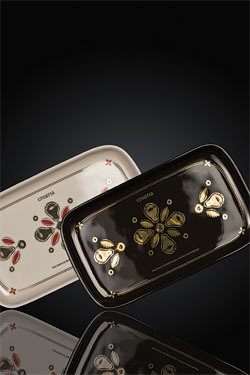 A biscuit tray with the traditional Paprenjak motives will fit every table! 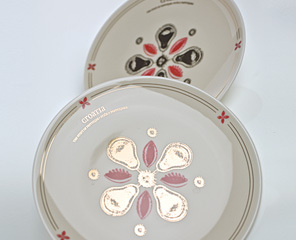 Decorative plate adorned with the motives of Paprenjak. Tea Tiiime™ herbal tea brought to you by Paprenjak. 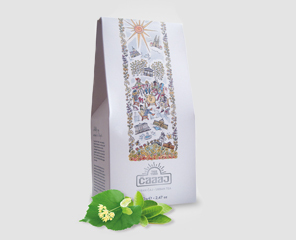 This tea will suprise you with its clearness and a mild yet rich taste of croatian herbs. Calms the tummy and the mind. Tea Tiiime™ urban herbal tea brought to you by Paprenjak. 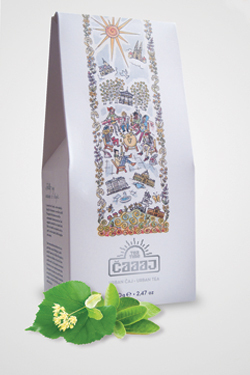 Its flavor is inspired by the smell of Zagreb's blossming tilia trees. A clear infusion for your mind and body. New 150g. 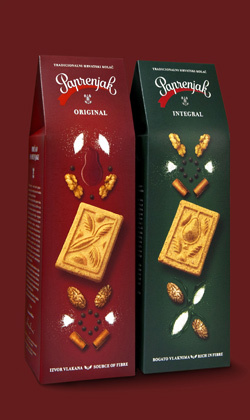 pack of thinner and crispier Paprenjak biscuits. 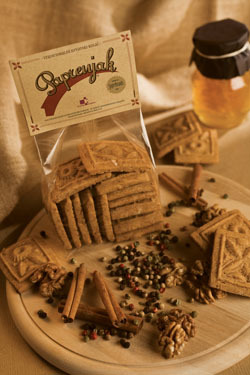 They come in ORIGINAL and INTEGRAL (whole wheat) versions! 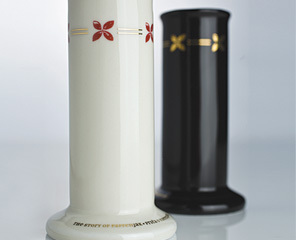 Paprenjak Souvenir, single-packed, 17 grams. 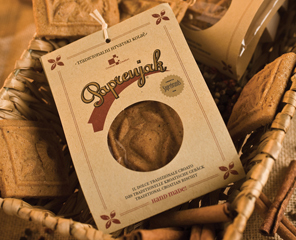 Our most representative product, presenting the paprenjak as a traditional biscuit, its packaging reminiscent of a parcel “ for the road “, and enriched with the story of Paprenjak on the tag. Ingredients and code are printed on the jacket. 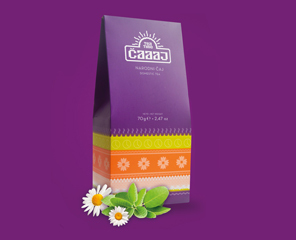 Packed in a polypropylene bag with a paper jacket stating the product name, ingredients, weight, expiry date and manufacturer's business details, as also product quality marks. Ingredients and code are printed on the package. This individually packed paprenjak weights about 17g, it is protected with a polypropylene wrapper and wrapped in a paper jacket. Through the opening on the jacket one can see the relief pattern, and the jacket is bound with bark – fibre. The story of Paprenjak is told on the back of the jacket. Ingredients and expiry date are printed on the inside of the jacket. 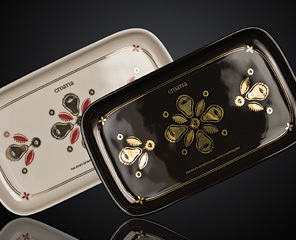 We have enriched the traditional biscuit Paprenjak with the value of a tin box of distinctive design with the motif of the Paprenjak – the traditional Croatian biscuit. 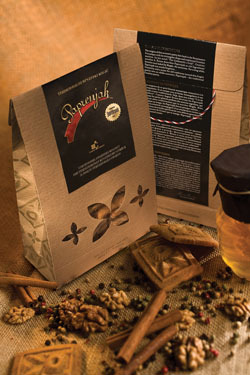 Luxuriously packed in a polypropylene bag, inserted in a designed craft – paper packaging, enriched with the story of Paprenjak. Sealed and bound with the jemstvenik, i.e. a three – coloured security cord. 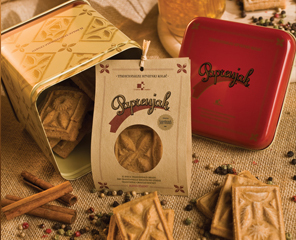 This packaging of the Paprenjak perfectly conveys the spirit of the product – a centuries-long folk tradition of biscuit-making and of preparing the holiday table with food. 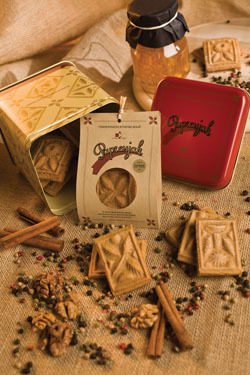 The Paprenjak biscuit tells, through its relief and motifs, a story of life, endurance and values transcending a man's lifetime. Ingredients and code are printed on the packaging. 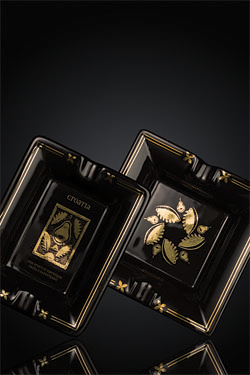 The Paprenjak, a traditional Croatian biscuit, is characterised by reliefs pressed in the dough by the paprenjak moulds. In that way a biographical relief with symbolic religious and pagan motifs, such as a lamb or a fish, is left on the biscuit, as a metaphor of Christ, or with traditional folklore motifs of flora and fauna. 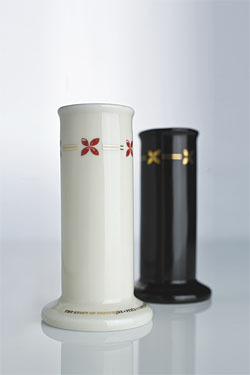 The diversity of motifs on the Paprenjak, the traditional Croatian biscuit, enriches the range of products in porcelain. 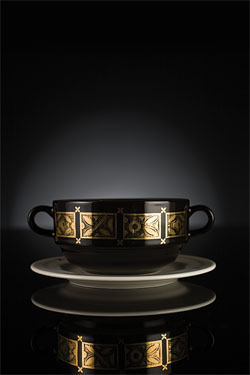 Soup bowl (black) i saucer (white). 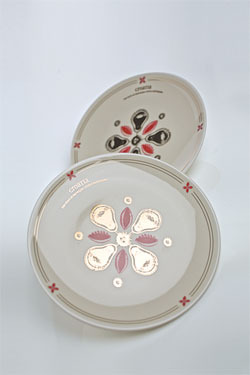 Saucer diameter: 15 cm. 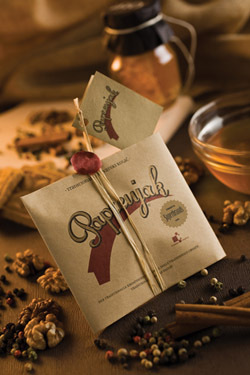 Tea Tiiime™ is Paprenjak's line of herbal teas. 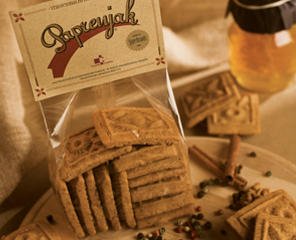 The combination of the aromatic biscuit, Paprenjak, and a clear warm tea is a perfect one. 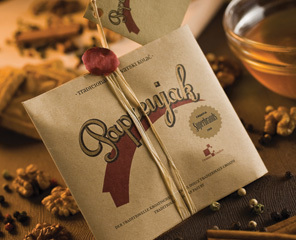 This herbal infusion mixture is motivated by herbs traditionally found and enjoyed across Croatia. 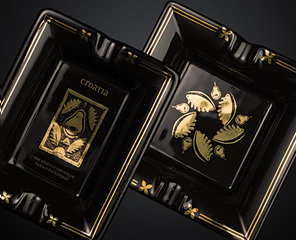 Take the smell and taste of Croatia back home with you. This particular "urban" mixture is motivated by the smell of the tilia trees in the month of June. In Croatian, June is called by the name of Tilia trees, due to its mild but powerfull presence. Add a dash of herbal tea to your urban oasis. 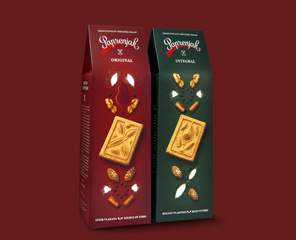 150g package of thinner, crispy Paprenjak biscuits. While ORIGINAL was made by the traditional recipe, INTEGRAL contains whole wheat flour! 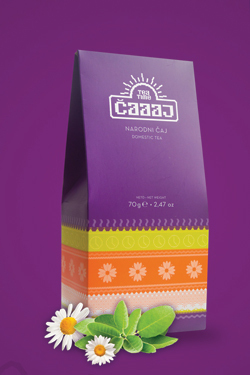 At the moment, you can find them in all bigger DM shops across Croatia, in the "healthy food" departments.